Did you know that a staggering 95% of leaders think that they are more influential than they actually are? This suggests a surprising lack of self-awareness among leaders in the workplace according to author and executive coach Stacey Hanke. So how do you slip into that 5% of leaders who aren’t deluded about their own level of influence? 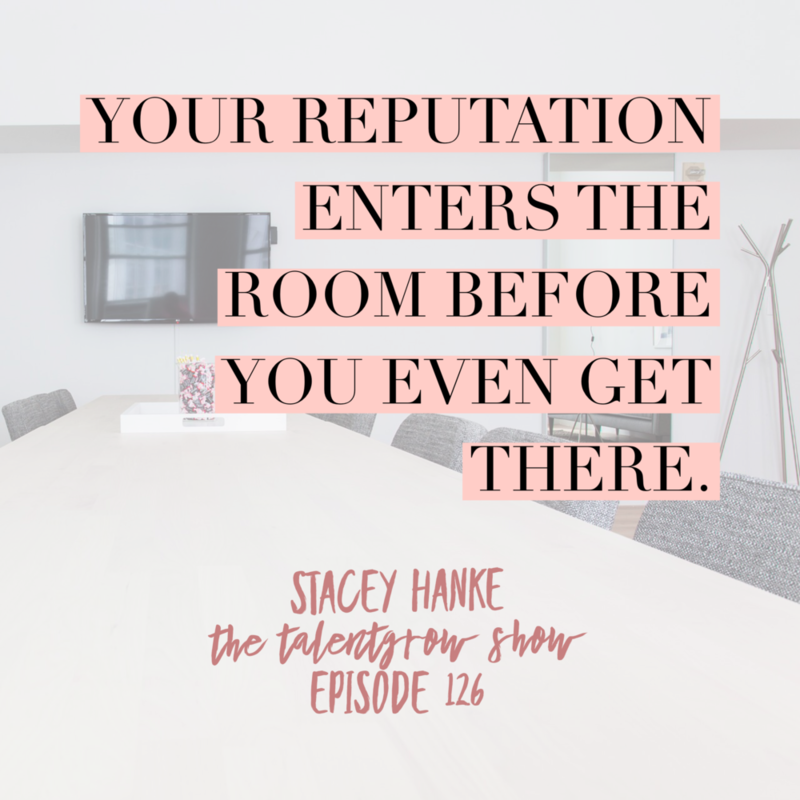 Stacey joins me on this episode of The TalentGrow Show to share very actionable advice for escaping feedback-bubbles and ditching bad workplace habits that result from a lack of self-awareness. She also weighs in on the impact of our fast-changing technological world on human interactions and communication and discusses what we can do to effectively ‘stand out’ today and in the future. Plus, discover how Stacey ties in leadership and culture to parents and children, and what this compelling comparison means for leaders and managers! Listen and share this episode with others in your network. Check out the video from Simon Sinek that Stacey and Halelly talked about! reactions, and without further ado, let’s dig in. 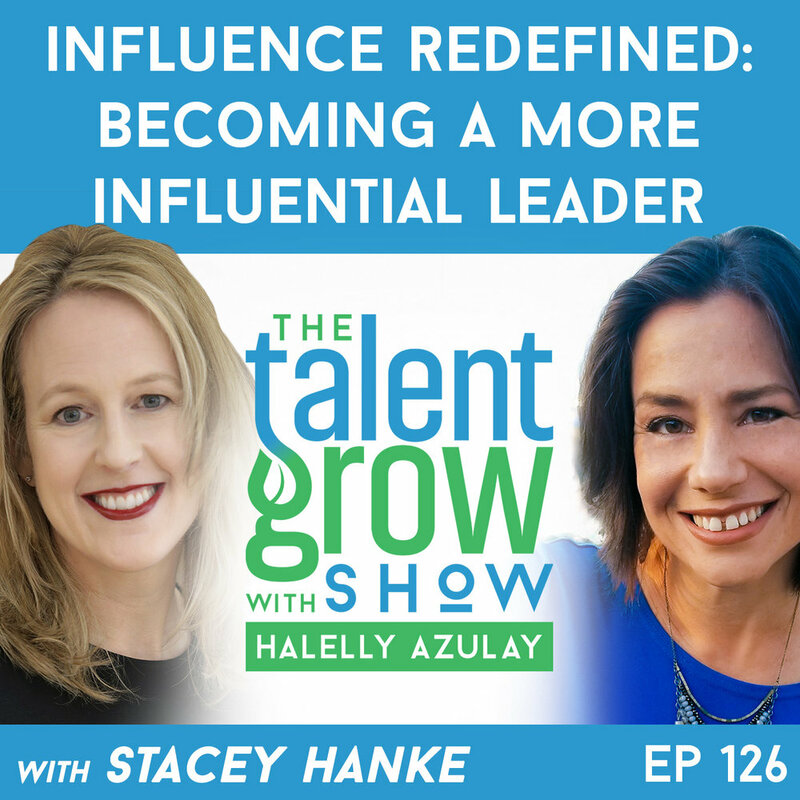 TalentGrowers, based on more than two decades working with hundreds of thousands of leaders, C suite mentor Stacey Hanke has found out that many of today’s leaders have mistaken beliefs about what it means to be influential. I’ve asked her to come on the show to talk about why the prevailing influence paradigm is outdated, according to her, and ineffective, and technological advances only make it more challenging to influence others. 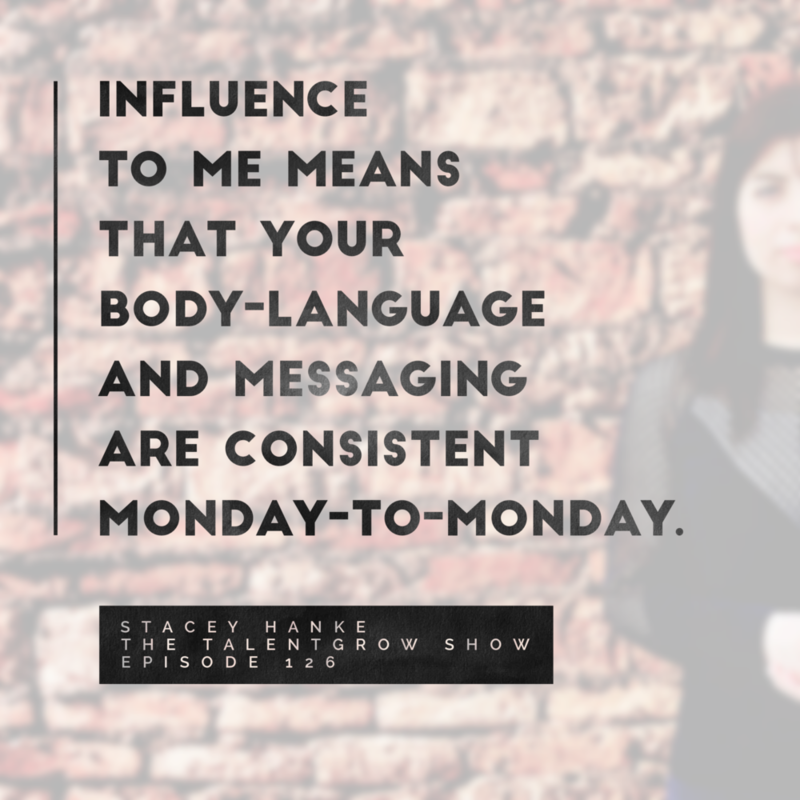 As a result, Stacey says the vast majority of leaders – a staggering 95 percent of them – think that they are more influential than they actually are. Stacey’s new book is called Influence Redefined, be the leader you were meant to be Monday to Monday. Stacey, welcome to the TalentGrow Show. Stacey: Thank you. These are always an honor. I so appreciate your trust with me and your listeners today. Halelly: I’m sure they’re eager to hear about whether they’re one of those 95 percent! But before we get into it, before we do, we always ask our guests to describe briefly their professional journey. Where did you start and how did you end up where you are today? Stacey: I started in radio. I wanted to be the next Katie Couric, but apparently that did not work out. I did radio for a while, and then I moved into the corporate world and I landed – every time I went to corporate world – I landed in training and development positions. That’s my degree, my background. What I noticed in those positions, no matter if I was teaching leadership skills, customer service, whatever it was, no matter how smart someone was in their own industry, in their profession, that didn't matter if their communication was poor. Then after a couple of other stops, I worked for an international company before I broke away on my own, 16 years ago, and I traveled internationally, teaching presentation skills. It never felt right. I never could understand, “Why am I teaching someone how to stand up and present only, when that only happens once or twice a month, depending on the audience?” That’s when I started to make the shift. I started to realize that this whole idea of the reputation people create of us, the perception people have of us that leads to the amount of influence that we have really is about how we show up, how people experience us everyday, every interaction, not just when the stakes are high we turn it on for perhaps a formal presentation. Halelly: Is that what you mean by Monday to Monday? Stacey: You’ve got it! That’s what I mean by Monday to Monday. That’s become our signature tagline. A lot of our clients know us as Monday to Monday. I really believe that. I believe true influence is someone who has that reputation. There’s also many adjectives that fall below influence, adjectives like confident, trustworthy, credible, and the list goes on. In order for that to be authentic, that people really see you that way, you can’t get them guessing every time you show up. It’s more about creating this consistent brand of influence that whether you’re on the phone, like we’re doing today, whether it’s hallway conversations or the rare chances you get to prepare, that’s the perception you built, that you continue to sustain, for people to build that trust with you. Halelly: I’ve heard that it’s like you’re on someone’s radar when you enter the room, when you get on the phone. Not just when you suddenly step up to the mic to they start noticing you. They start noticing you whenever you come into their peripheral vision. Stacey: It’s so true, and I think it’s also too, depending on who is listening to this interview right now, whether it’s the peers you have in your office or if you’re in a position where you’re interacting with external clients, your reputation enters the room before you even get there. Your reputation enters someone’s inbox before you hit send. The good news is you get to determine what reputation that is, based on how you show up, through your verbal and your nonverbal communication. Halelly: When you say that 95 percent of leaders think that they’re more influential than they actually are, can you explain? What do you mean? Stacey: That’s research, really, over the past 16 years. We do a lot of work with directors to CEOs, whether that’s in a workshop format or that’s one-on-one. Over the years, I started to calculate how many times an executive would say, “I had no idea that’s what my behavior communicated. No wonder I don’t get people to follow me. No wonder our meetings take too long. No wonder we’re not making the sales we need to make.” It’s communication. You and I both know this, based on your show and what you represent. Communication is the core to everything that we do. A lot of times, the search for, “We’re not making sales. Why are our meetings so long? Why are we not as productive as we could be?” You start peeling back those layers and you realize the majority of people aren’t as influential as they think they are. Not that they’re not influential at all, but the level of influence I’m talking about, this idea of consistency Monday to Monday. Halelly: It sounds like one of the big gaps in how people think they’re perceived and how they actually are perceived is not realizing that it’s not just when they think they’re on that they’re on. That’s one of the biggest gaps there. Stacey: Yeah. You’re so right, and you’re hitting on something else without saying it. It’s the lack of a self-awareness. I’m so intrigued with body language – how can we behaving a certain way, saying what we say, and yet it feels different? It sounds different to us. Until that awareness of how do you experience me right now versus how I experience myself, until that self awareness is there, without it, we are determining the level of influence. We’re determining how people perceive us off of how we feel, rather than what reality states. Halelly: So how can people get more self awareness then? Stacey: I knew you were going to ask that. It’s something that our listeners are going to totally roll their eyes. You’ve got to videotape yourself. We’ve got the technical gadgets to do it – just do it on your phone. Halelly: I bet everybody got a stomachache all the sudden! Stacey: Exactly. Everyone says, “I don’t want to watch it.” If you don’t watch it, how do you know? And it’s not just video. It’s audio. As a team, we do it religiously every month. My team has to record themselves and I evaluate them, they evaluate me. We obviously want to be practicing what we preach, and I am amazed that when I accomplish a new norm, when I polish whatever I’m trying to polish on, low and behold, I’ll notice that I have failed in something else. Influence Monday to Monday building that, sustaining that, really is a lifelong process. That’s another piece of influence. I don’t think most people realize the amount of work and consistency behind it that goes into it. Halelly: But when you think about the people that really do have an influence on you, for example, as I reflect on it, I know for me, they are people who seem in integrity, they seem authentic. They don’t seem like they just turn on the on button and have some kind of an influential message and then they’re done and go back to doing something totally different. Stacey: Yes. It’s so true. Maybe our listeners right now are thinking through that. Who in their mind is consistent? That no matter what day of the week, no matter what type of medium you’re interacting with them, you always know what you get. If you think of those people in your life, I’m guessing you can probably relate, and those are the people I admire. Those are the people that when I need advice, I go to them. Because I know that it’s always the real deal, I get the real them, versus someone that turns it on for the moment. Halelly: The “do as I say, not as I do” folks. Halelly: You say our influence paradigm is outdated. What do you mean? How do you define influence, and what do you think is different now and what’s going to be different in our future? Stacey: You’ve got it. The first half, the idea of the paradigm which ties to my definition, Influence Redefined was published last February. Leading up to that time, spent a number of years doing that research. I really wanted to figure out why do some people have more influence than others? What is it? The paradigm, the old definition is, you have a high-stakes meeting, conversation, coming up and you prepare for it. You practice leading up to it, and then when it’s done, it’s done. Influence to me, that new shift, is body language and messaging. They’re consistent Monday to Monday. That’s the first part. The second part, that we have this ability to move people to take action, long after the interaction has occurred. Why that’s important, if you think about the type of world we now live in, it’s a new world of business called noise. 24/7 we are receiving messages. Virtually, in person, we’re constantly getting bombarded. It’s making it that much more difficult to be memorable, to stand out from the noise. That’s where that new paradigm shift is, which leads to the definition I just gave you versus what the old definition is. Halelly: So what do you think is different? You just mentioned a little bit of what’s different now, but what’s going to be different in the future, if anything? Stacey: The obvious is the technology. The many ways that we get an opportunity to communicate. There are so many focuses around Millennials, Gen Z, these generations that are coming up that are born with those gadgets in hand. I don’t know if you’ve seen any videos by Simon Sinek. Some really great videos. I came across one last week that talks about what’s happening with children growing up with the tech gadget in hand. Halelly: I’ve seen it! It’s great. Stacey: Isn’t it? He’s got some really great stuff. Great stuff because it’s commonsense. It’s not common practice. Not to blame parents, but it has to start somewhere. It’ll be interesting to see what happens with face-to-face communication, because we’re so tied to our technical gadgets. That goes across generations. I truly believe that face-to-face is becoming a lost art, yet we have to have face-to-face conversations. Eventually, you have to have one, because that still is the core to building relationships. Simon Sinek, this one happened a while ago, the video, where he talks a lot about the endorphin rush of how many likes can you get from your Facebook post? How fast can you get responses to your text messages? That is such an endorphin rush for us, that’s what we’re building our quality of relationships from, when you and I both know that’s not … your Facebook likes and friends are not a quality relationship as a face-to-face communication can be. Halelly: That’s true. By the way, we’ll link in the show notes to that video, in case listeners haven’t seen it. They’ll get a chance to get that endorphin rush satisfaction of getting their curiosity addressed. So the technology is something that is changing how we interact with the world and causing us to lose some face-to-face skills. Anything else we should be on the lookout for? Stacey: When I hear you say that, it also ties to, there’s a through line, a pole line, to keeping people’s attention. Because we receive so many messages 24/7, it’s making it that much more difficult to keep people’s attention. Our words alone are not going to cut it. You can hear a lot of different tones in my voice, how my volume changes. You can’t see me, but I’m using gestures to help me do that. The body language is going to be even that much more critical. Your word choice is going to be that much more critical, and the ability to adapt your message, to make sure you resonate with that particular individual you’re trying to influence, all of those three are going to assist you to stand out from the noise. If we are part of every other message that individual you’re trying to influence receives in a day, you start to fall into a hole, versus what can you do, what can you say, to make sure that you and your message are memorable? Halelly: Any particularly memorable stories for you of maybe clients or leaders that you’ve recently met that had a problem like this that they didn’t realize? I’d love to share that. Maybe even if it’s a turnaround, even better. Stacey: Gosh, there’s so many stories. One of my favorites, that I’ve shared often, is a CEO that I was working with. I did videotaping, I videotape everything, because I don’t know how else to get people that awareness. We did a video recording. He and I sat and watched the recording. We’re not even 15, maybe 10 seconds, into his playback and he looks at me and says, “I bet you wonder how I ever became the CEO?” What was happening, when I asked him, “Where is that comment coming from?” he confessed that everyone tells him the feedback he wants to hear – how great, how good he is – and he had never seen himself on a playback. That’s probably, no matter who I work with, even if it’s someone who regularly see themselves here and there on a playback, that’s what a leader is probably the most surprised by. How can I come across this way, sound this way, yet when I’m in the interaction, when I’m being recorded, I experience something different. That’s another piece of that awareness that we need to build to help us to determine how are we coming across? Is our message resonating with our listeners? Do we just say too much? Do we have to say more? Without that awareness, it’s almost as if we’re having a conversation with ourselves. Halelly: What did he see that made him think that he wasn’t CEO material? Stacey: Long winded. A lot of filler words. The ums, the ahs, so, and, the list goes on. His body language came across fidgety, whether it was hands, his feet were constantly moving rather than moving with purpose. And that goes back to the introduction where we started this call – his body language was inconsistent with what he was saying. Halelly: Interesting. How did you work with him? I guess in general I’d love to hear, what can people do to maybe become more aligned between their words and their nonverbal and to become more influential? Stacey: What I did with him, that I think anyone can do, it’s a lot of practice. If I were to take you on a tennis court, and you’ve been playing tennis for 20-plus years, your behaviors are habits. To the point where you might not even realize what’s working and what’s not. I video record you, doing the tennis game, doing the serve, doing your forms, your drills. Every time we sit down, we look at it, review it, and we pull apart here’s what’s enhancing your game, here’s what’s causing the game to not go in your favor. It’s the constant swinging of the tennis racket. It’s the constant practice of watching yourself on a video playback during any type of conversation. Again, you can record yourself really at any point, as long as it’s not violating anyone’s confidentiality, and then watch it. The other piece that I think is key is having that person in your life, perhaps in your personal life or professional life, that you know is going to be honest with you. That is going to honestly tell you what works for you, what doesn’t work for you, to increase your awareness that when you’re in a conversation, you’re rambling. When you’re in a conversation, you’re fidgeting rather than having purpose behind your movement. Without those two, the video playbacks and without that accountability partner, it’s really tough to improve your tennis swing because you only know what you know. Halelly: Good advice. Get more awareness by videotaping yourself and by also maybe getting an accountability partner and then begin to work on forming new habits based on what you’ve observed. So what are some habits? What are some things that can be seen as influential that people can work on? Stacey: The biggest one is trust. Without trust, influence will not occur. Where trust is built is through what you do with your eyes. And it seems so commonsense, most of us know eye contact. I call it eye connection. What eye connection means is that if you’re not seeing a pair of eyes, stop talking. And how many times are you maybe at a restaurant and there’s other couples around you and you can see they’re talking to their phones instead of talking to each other. Physically talking, but they’re looking away. How many times have you been in an office environment or a meeting situation and the person leading the meeting is talking down at their notes? When we really keep our eyes and ears open for the next week, just pay attention to every time you speak, are you truly looking at a pair of eyes? Or are you glancing away and talking somewhere else? I’m a big proponent of eye connection. I think without trust, it’s really hard to create that influence. I’m not saying, you don’t want to stare at people – that’s not what we’re talking about. You can look away as often as you need to, just don’t talk when you look away. Halelly: Interesting. I’ve been plotting a solo episode – I do solo episodes about every fourth episode – and this brings up an example that I’ve been thinking to do a solo episode about, but it’s just so relevant I’ve got to share. Just last week I was doing one of my workshops and one of the participants was constantly doing a role-play of a critical conversation while looking at her phone. And I said to her, “Is this something that’s related to this conversation that you’re here strategizing with your peers on, or what’s going on? I’m noticing you’re looking at your phone.” She said, “Oh, no, I’m multitasking.” I said, “I don’t think that’s going to help you very much in connecting and so let’s try to do this with full eye contact.” Later on that day, when we talked about the importance of congruence between the nonverbal and the verbal, and I gave an example of how it’s disconcerting and disconnecting when someone is looking at their phone, she spoke up and she said, “All of the executives in my company do this, and they all are successful and they know how to multitask and I’m trying to emulate them to be successful too.” It was like, whoa, that’s a difficult moment. Because she’s being led astray by people who are under, like that CEO, who are not really understanding the impact of what they’re doing. Stacey: You bring up such a good point. I was just editing an article that will hopefully soon go out and it’s exactly about this. I tie leadership and culture to parents and children. Now, I’m not a parent. I have a lot of little nieces, bugs, running around in my life, and my sisters and I always joke about when they go to their kids’ school, they can pick which child belongs to what parent, sometimes. Through behavior. I always tell leaders – and this is why my company focuses primarily on directors to the CEO – because I know if they’re not at the level of influence that they have the capability to be consistently demonstrating, it is a negative reflection of the culture. The good news is, as a leader, or maybe you’re a leader of a meeting, you can control what happens in that meeting. How you behave is how people respond. If you’re constantly on your phone during someone else’s meeting, that is telling everyone else that behavior is okay. Now, for any of your listeners who are in her role, the example that you gave, don’t follow that leader! If you know that it’s not right, that it doesn’t respect other people’s time, be different. Be memorable. Just because they do it does not mean that you need to do it. Halelly: Amen! My mother always said two wrongs don’t make a right. Stacey: So true. Can you tell it’s a pet peeve? Halelly: For me too. I see it everywhere and it is increasing and I see it in my personal life. I will not be calling out any individuals who believe they’re listening to me while looking at their phone, but we regularly have disagreements about that. I’m not buying it. Stacey: We do as well. I can remember back in the day, I always thought we were so old school growing up. My dad at dinner, we couldn’t listen to the radio, we couldn’t have the TV on. We had to talk. We had to have conversations. And now, every time I go to a restaurant when I travel and I’ll be hanging out by myself and look around, the amount of families that the kids are heads down, the big beam of light from their phone is shining in their face, we’re losing that connection and that ability to engage. Halelly: Stacey, it’s been interesting and we’re almost out of time. Before you share that specific action, what’s new and exciting on your horizon? What project or discovery has your attention these days? Stacey: The constant is the innovation. The constant is the research. Because your question earlier was, where do I see the future? The new exciting is the fact that we’re constantly looking for new concepts, new ideas, new ways to just really get our message across, to catch the masses. That might not sound exciting for our listeners, but I know as a business owner, you can’t stay steady. You’ve got to continue to think about how can we innovate and this is always such a good time of year. We’re right in strategy mode, really laying out what does 2019 look like? What else can we do to continue to provide value for people on this topic? Halelly: Catch the masses. What do you mean by that? 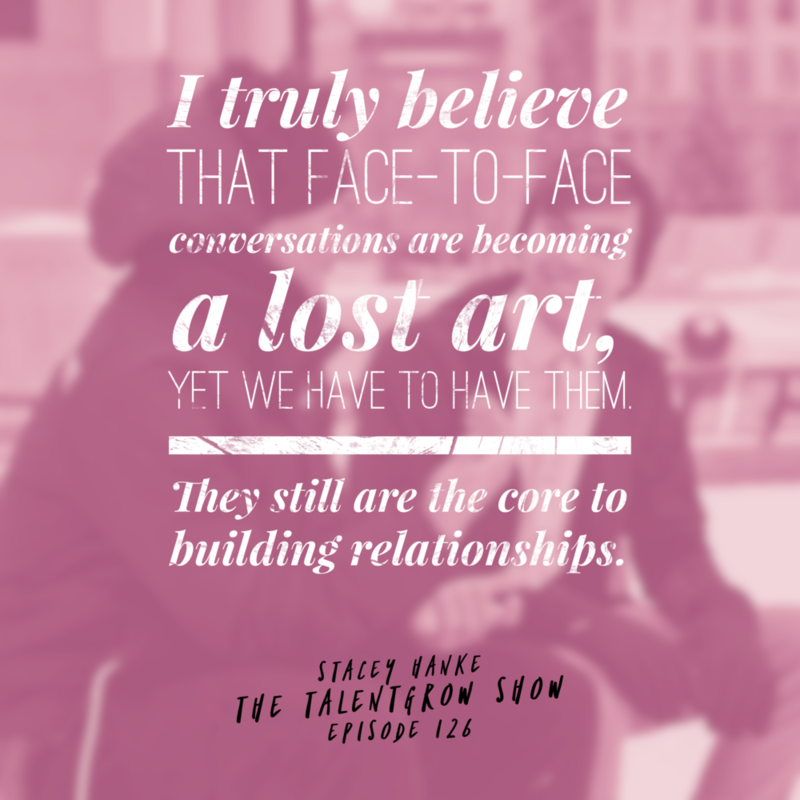 Stacey: I do this to really get the message out, to be able to touch as many people as we can with this concept of so many of the challenges that you might have with getting people to act, to getting people to follow you and listen to you, it might be you. It might be how are you coming across? And I think, really, the topic too we’re talking about today, it applies not just to your professional life. It applies to your personal life. I receive many emails from parents, asking me, “My teenager doesn’t do this. I can’t get them to put their phone down.” Whatever it is, and you realize, wow, this topic is really one that’s been around forever, but we’ve forgotten how to apply it and use it. Halelly: It comes up again and again and it will only do so more in the future. So what’s one super specific action that our listeners can take today, tomorrow, this week, that can help them upgrade their own leadership and/or influence success? Stacey: You know what I’m going to say. Record yourself. Even if the video recording is too big of a first step, at least audio record yourself. Do it, listen to it and know that you may be pleasantly surprised and say, “I had no idea, but that isn’t as bad as I thought.” That’s really important, because you want to continue to work on that skill, whatever that skill is. On the flip side, it does become – I don’t want to say it’s easy. I don’t think recording myself is any easier than it was in the past – but what starts to happen though, you start to see the benefit and the value of taking that step, that you get to the point that you don’t want to stop because you know it’s always going to help you grow. Halelly: How do you typically tell someone to do this? Do they set up their phone on a tripod or what do they do? Stacey: You can make it super easy. One thing that we do often in our office is, when I’m on a call with a client, I’ll record myself on my smartphone. I don’t record the client, I just record my side. When I listen to it, a great way to listen to it is to pay attention to what you felt like, how you believe you came across rather than what reality states. Now you can also do that in a video, just prop your phone up against a book or something on your desk that you’re video recording yourself while you’re on a client call. That way you get both. If there is anyone on our call today that has meetings with their teams, you easily could record yourself there as well. And if people are wondering, “Why are you recording yourself?” you could say to them as their leader or as their peer, you want to make sure the best of your shows up every time. The only way to be able to do that is to take a look, to experience yourself through their eyes and their ears. At home you could do it all the time if you really wanted to. Halelly: I think you should be very transparent, actually, with your team, because you talked about trust earlier. Vulnerability builds trust. We know this. So you showing up as someone who is still a work in progress and willing to admit that they’re not perfect and showing that you’re working on it allows other people to feel more comfortable to also not be perfect and keep working on themselves. Stacey: It’s so true. That’s what it’s all about. This is not about your listeners ending this call and thinking, “Wow, I can never say another um or ah in my life.” It’s more about being aware that any conversation you’re on, moving forward, you know when your message is not resonating. You know when you’re taking too long, wrap it up. You know when that connection and engagement, they’re not paying attention to you. You can stop it and make the adjustment on the fly. Halelly: Right. The more that you get evidence, the more you get empirical evidence, objective data like a recording, the more that you can see the trend. You can see the improvement. Stacey: Right. That’s it. Because we are our worst and our best critic, for both of those reasons, it’s beneficial to just experience yourself and do it a couple of times. The first time, you might not like it. Halelly: That’s great. Well, thank you so much Stacey. It’s been fun talking with you and I’m really glad we got a chance to have you come on the TalentGrow Show. How can people stay in touch, learn more about you and from you? Stacey: Thank you for the opportunity. There’s tons of resources. We serve them as truly resources for people to tap into. It’s StaceyHankeInc.com. Halelly: And we’ll link to that in the show notes. Are you on social media? Should they follow you anywhere? Stacey: You bet. When they go on our website, they’ll see all of our links to all of our social media. We are constantly there as a resource to pump out concepts, ideas, that we can also be their accountability partner from afar. Halelly: I saw on your website, you really do have a lot of resources, including I think like a weekly video you can sign up for, right? Stacey: Yes, that’s actually a year online program. It’s a one-year online mentoring program, so for 52 weeks, every Monday you receive a tip, a concept, an idea. Halelly: Very cool. Listeners, I’m sure you’re going to go check that out, and Stacey, thank you again for your time today. I appreciate you. Stacey: Thank you so much. Best to you. Halelly: All right TalentGrowers, I hope that you enjoyed this interview with Stacey Hanke and I hope that you’ll take action. Did you get the butterflies in your stomach when she said to record yourself? I know that a lot of people do and don’t let that stand in the way. A lot of times that’s a sign that it’s something important. Plus, what could be so scary about that? It’s just information. It’s just information that you can take in and add into whatever other inputs you have that tell you what you want to work on. We are all a work in progress. Life is a learning journey. I definitely want you to have that growth mindset, as Carol Dweck described it, rather than a fixed mindset that I am who I am and I can’t change. With a growth mindset comes an opportunity to grow. By the way, at around the 20-minute mark or so, I tell a story about something I was thinking about putting into a solo episode in the interim between when I had the conversation with Stacey and now, when I’m releasing it. I already recorded and released that solo episode about not listening in a distracted way, while looking at your phone when you’re having critical conversations. That story about the participant in my workshop is in it, and some additional information about why it’s really important to pay full attention. If you’re interested in that one, it’s episode 123. It was just a couple of episodes ago, and you can go check that out. I also wanted to share with you a brand new Apple Podcasts review that I received. That’s the new name for what used to be iTunes, and the podcast review title is “Great podcast to help your career.” It comes from a listener named jrumley19. This review says, and I quote, “If you’re looking for a podcast to help you learn new skills from some of the best minds in business, this is well worth a 30-minute per week investment of your time. You’d think this is a podcast produced by a team at NPR because the quality is that high. The topics are extremely relevant to everyone in corporate America and Halelly Azulay is a natural at interviewing. Each episode contains useful tips, insights and interviews with experts to help you grow your skills.” That is such a nice review. I so appreciate you jrumley19. Thank you for taking time to go into Apple Podcasts and leave this review. You, TalentGrowers, I really hope that you’ll do the same. Just go into Apple Podcasts and you type a two or three sentence review, just like this, and say something nice and heartfelt, based on what value you’ve received from the show and why you like it, and that helps other people in the discovery mode, looking at new shows to consider, to decide to give this show a try. I would appreciate that so much. I produce this podcast for you for free every single week and if you do receive value from it, maybe consider this as a small token of your appreciation. I would certainly be grateful and thanks in advance. That’s it for another episode of the TalentGrow. I am Halelly Azulay, your leadership development strategist here at TalentGrow. Thanks again for listening and until the next time, make today great.